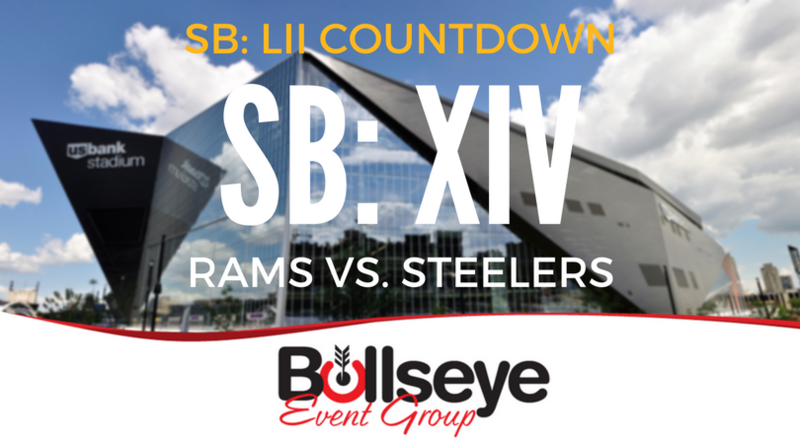 As we continue on the Road to Super Bowl LII in Minneapolis, the Los Angeles Rams make their first appearance in the Super Bowl LII Countdown, facing off against the Pittsburgh Steelers in Super Bowl XIV. Played at the gorgeous Rose Bowl in sunny Pasadena, California in front of nearly 104,000 fans, the Los Angeles Rams and Pittsburgh Steelers met for the first time in Super Bowl XIV. Pittsburgh would capture yet another Super Bowl title, defeating the Rams by a score of 31-19. This was the first time the NFL had a team that hailed from the same surrounding area as the Super Bowl host, with the Los Angeles Rams playing just 14 miles from the LA Memorial Coliseum. The Steelers also made history in Super Bowl XIV by becoming the first team to capture four Super Bowl titles, doing so in just a six-year span. The game was close for the majority of Super Bowl XIV, with Steelers quarterback Terry Bradshaw connecting with wide receiver Lynn Swann for a 47-yard touchdown pass, highlighting the Steelers victory. Bradshaw would go on to win Super Bowl XIV MVP award honors, finishing the game with 309 yards and two touchdowns. Pat Summerall and Tom Brookshier would once again handle the broadcast duties at the Super Bowl, broadcast on CBS in 1980. A 30-second commercial continued to rise in price, standing around $222,000 for Super Bowl XIV. The halftime show entertainment was provided by Up with People, presenting “A Salute to the Big Band Era.” Interesting enough, the Nielson Rating was 46.3 with an estimated 76.2 million viewers tuning into Super Bowl XIV.